3) Missional church is about the nature and purpose of the church: The church is an essential part of the missional conversation. The question which the authors of the book Missional Church set out to address was the nature of the church in North America as the agency of God’s mission in the world. That part of the discussion focused attention on two critical areas of dialogue a) the nature of the culture in which we currently are located as North Americans and b) the purposes of God in the world as revealed by Jesus Christ and his Gospel. In terms of the former, the church is no longer at the center of the culture. This raises fundamental questions about the relationship between Christian life and the pluralistic culture in which we now live. In terms of the latter, the message of Jesus was about the in-breaking of the reign of God into the world. Therefore, on the basis of both these motifs, the church is the called out community of God in the midst of the specificity of a culture. The genitive in that phrase (the of God) is not an objective but a subjective genitive. In other words, the church is called out for the sake of God; this is what God has done in Jesus Christ in order to call into being a new society whose life and focus is God. The church is, therefore, an ecclesia, a called out assembly whose public life is a sign, witness, foretaste and instrument to which God is inviting all creation in Jesus Christ. The church, in its life together and witness in the world, proclaims the destiny and future of all creation. In this sense, local congregations are embodiments of where God is calling all creation. The church anticipates the eschatological future of all created things through the power of the Spirit. This is why Lesslie Newbigin gave so much energy in his early writing to understanding the nature of election in the biblical narratives of the reign of God. Election is not the rescue of human beings from some future damnation. It is the call of men and women (in the mystery of God’s purposes) to submit their lives to the God who encounters us in Jesus Christ for the sake of the world. Again, to put that into the context of the church in North America (which is largely middle class and suburban) the call of God is to a vocation for the sake of the world, not one’s own personal needs. In this context (and not any other in this conversation) the church is not a gathering of those who are finding their needs met in Jesus. This is a terrible debasement of the announcement of the reign of God. The God we meet in Jesus calls men and women in exactly the opposite direction-to participate in a community that no longer lives for itself and its own needs but as a contrast society whose very life together manifests God’s reign. How the North American church could take this story, especially one focused around the One who, according to Philippians 2 emptied himself by giving up all his rights in obedience to the Father, into a story about God wanting to meet my needs, is a question that makes abundantly clear the church’s own need for radical conversion to the Gospel of God in Jesus Christ. 4) Missional church is a contrast society: The church is formed around a set of beliefs and practices which continually school and form it in a way of life which cannot be derived from the particular culture in which it is found, but must be embodied in translatable forms within a particular culture. Our North American culture is commonly designated as a modern or a postmodern one in which individual rights are paramount. We live in a context where it is simply assumed that in this tolerant and open society personal rights, feelings and desires are to be affirmed. As a contrast society the church is formed around a set of beliefs and practices that continually shape it in a way of life which cannot be derived from the particular culture in which it is found but must be embodied in translatable forms within a culture. Therefore, missional church is about what Catholic missiologists call ressourcement, meaning a return to the sources. Missional church is not about the modern mantra that we must reject the insular, conforming demands of the past with their so-called cultural captivities, for some new future that is all about meeting the needs of middle-class expressive individuals. Missional church, like the biblical texts of Jeremiah and Isaiah, is convinced that God has brought the Western church into an experience of liminality within its own cultural world, a place of marginalization, in order that through its loss, anxiety and chaos, it might hear again the Word of God. This was the experience of the exile in Babylon. The missional church conversation does not claim a parallel between our situation and that of Judah after 587 BC. The language of exile is alien to the North American imagination. People look at churches full of people and it seems to them that these are signs that all is well in the land. Indeed, the assumption is that if there is a problem with a specific congregation or denomination, in terms of dwindling membership or finances, it is because that particular group has wedded itself to outdated methodologies. All that needs to be done is to figure out the correct methodology for the moment and recalibrate the system for success just like those other church groups that seem to be thriving. This is precisely the lie that the religious leaders of Jerusalem used against Jeremiah prior to the exile. It was all a matter of finding the right tactics; God was, after all on their side and nothing could change that reality. Therefore, a little change here, a little tweaking there and all would be well. This is the situation today. 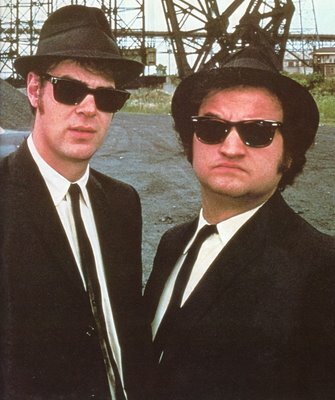 Grasping the paradigm shifts of missional takes a bit of effort – but it’s doable – Jake and Elwood had it figured out in 1980! Get some popcorn and watch this movie! While this 18 minute video won’t win any academy awards it does a good job of helping to fill out the explanation of Missional Church. This video is a discussion between Alan Roxburgh and Craig Van Gelder, Professor of Congregational Mission at Luther Seminary (but he is a RTS grad!). 1) Western society as a mission field: As indicated in the introduction, the language of missional church has to do with the recognition that somehow the Western societies are now themselves a mission field. This is saying something more than simply needing new evangelism tactics. To a large extent modern evangelism was practiced from within a context in which people generally took it for granted that the Christian story was a normative, regulative part of the cultural backdrop within which they lived. Put simply, most folks knew the basic story in one form or another. Evangelism was about understanding why they no longer accepted or lived in the story, developing a form of presentation or apologetic which addressed those issues and pressing for commitment. Evangelism assumed an environment of prior Christian understanding or background. The use of missional language is to suggest that this memory of the Christian story as the essential background to evangelism is, in most Western societies, essentially lost and can no longer be taken for granted. In this sense, most Western societies are post-Christian and are mission fields. We can no longer assume that the Gospel story is part of the cultural narrative of people. Now this is more-or-less the situation. Certainly, in Europe and England it is the case that the Christian story is all but a faint and vague memory that has no shaping power in people’s lives except among increasingly small minorities. In 2002 a major British tabloid published a front-page interview with a Catholic bishop in that country. The headline quote was: Christianity has almost expired in the UK! Stark language but not inaccurate. The same comment could be made for most of Western Europe. The majority of the emerging generation in Canada is growing into adulthood with no memory of the Christian narrative. What must be emphasized here is that twenty-five years ago this was not the case in Canada. The corrosive forces of change that had been building up for decades under the surface of popular culture suddenly reached the tipping point and rapidly transformed the culture. The dislodging of Christian life in Canada from the mainstream to the margins has been astoundingly rapid. Canada is not unlike America where the same kind of thing can and will happen. Thus, the missional language was created in order to emphasize that we are confronted with a radically new challenge in the West. We are not in a situation that requires minor adjustments and course corrections. We’re not in a place where simply planting thousands more churches or changing existing congregations to seeker-driven outlets or developing methodologies for natural church growth, is going to address the massive changes now transforming the landscape of the West. We need to fundamentally rethink the frameworks and paradigms that have shaped the church over the last half-century. The basic stance of denominations and congregations must be transformed to that of missionaries in their own culture. This requires far more than adjustment. It calls for a radically new kind of church. 2) Mission is about the missio dei: Latin phrases may not be the most appropriate form of communication in the 21st century, but this one does capture a theme central to the missional conversation. If the West, including North America, is once again a mission field within which the central narratives of the Gospel have been either lost or profoundly compromised by other values and stories, then the focus of this mission is the God who has encountered us in Jesus Christ-the One whom we confess in the Trinitarian confession of Father, Son and Spirit. This may seem like such an obvious statement that it needs no comment; however, this is not the case. The missional conversation is convinced that throughout Western societies, and most especially in North America, there has occurred a fundamental shift in the locus of the understanding and practice of the Christian story. It is no longer about God and what God is about in the world; it is about how God serves and meets human need. More specifically, the God who encounters us in Jesus Christ has become the spiritual food court for the personal, private, inner needs of expressive individuals. The result is a debased, compromised, Gnostic form of Christianity which is not the Gospel at all. The biblical narratives are about God’s mission in, through and for the sake of the world. The focus of attention is toward God not the other way around. The missio dei is about a theocentric rather than anthropocentric understanding of Jesus’ life, death and resurrection which itself, as the apocalyptic engagement of God with the world, breaks into creation in order to call forth that which was promised from the beginning-that in this Jesus all things will be brought back together and made new. The focus of this movement is doxological. It is not about, in the modern, Western, expressive individualist sense, meeting my needs. The personal pronoun is not the subject of the narrative; God is the subject. This is a fundamental element in the missional conversation. Enough has been written about this issue of the locus and intention of the Gospel and its debasement to an individualistic, needs-centered story in North America that it doesn’t require further expansion in this brief essay. But whenever this part of the conversation takes place, it creates consternation and confusion among both clergy and laity alike. If, they ask, the Gospel isn’t about the individualistic, personal-need-focus of expressive individuals in North America, then what is the nature of the Gospel? The question reveals the level at which our framework must be radically changed in order for the people in North America to hear and practice the Christian narrative once again. There can be no minimizing the level of the change required for the Gospel to be heard again in the West. The language of missional was coined in order to capture and express a) the locus of the Gospel on God and God’s actions, b) the depth of the compromise that has overtaken Christian life and c) the extent of the challenge we face in addressing this situation. So what the heck is “missional” (and why should I care)? Following is the first of a 3 part post (sorry but it really does take more than a couple paragraphs to get a complete enough unpacking of the term to avoid any “short circuits” of understanding). I’m going to utilize a document written by Alan Roxburgh in 2004 as the substance for these posts (with a few of my comments along the way). I was able to find a somewhat dated bio if your are interested in leaning about the author. Almost everywhere one goes today the word missional or the phrase missional church is used to describe everything from evangelism to reorganization plans for denominations, to how we make coffee in church basements and denominational meeting rooms. In a very brief period of time a new form of language entered the common conversation of the church and diffused itself across all forms of church life. At the same time, it is still not understood by the vast majority of people in either leadership or the pew. This is a stunning accomplishment: from obscurity to banality in eight short years and people still don’t know what it means. These facts suggest something of the flux, stirrings and search for points of reference that are now shaping the church in North America. The missional language would have died and disappeared like so many other words and movements of the church if there wasn’t already present an underlying sense that something is amiss about the Christian life and identity at this point in time. Anyone with a passing familiarity with the movements that have shaped the church on this continent over the past half-century is aware that this has been a period of massive change and upheaval. It was into this context that the missional language came and was received as a hopeful sign of how we could talk again about the challenges facing Christian identity. But at the same time, it is a testimony to the absorbing power of modernity that the missional language could become so meaningless so quickly. Each of these sides-the readiness of the church to receive missional language in the midst of tremendous flux and change, as well as, the capacity of modernity to absorb and neutralize it-must be part of our discussion. What is happening behind these dynamics? What are the implications of the missional language today in the life of the church? In conferences, teaching sessions or simply dialogue with other leaders, the question is still continually asked: What do you mean by missional church? The non-clergy are the most confused by and suspect of the word missional. They perceive it to be another unnecessary piece of esoteric language invented by clergy and seminary professors. Thus there is suspicion of the language and not a lot of trust that it means more than a fancy idea about evangelism or mission. There is a need for clarity and explanation. Where do we start in a description of what it means? There are multiple levels to an adequate response which is what makes the problem of meaning significant. If the language of missional church is to become a helpful way of forming communities of God’s people in a radically changing culture then we have to spend the time and energy to understand what is at stake in the language we are using. Simple sentence definitions are not adequate. The missional church conversation is far more than finding new words for old ideas. It is not about putting new paint over the cracked and chipped frames of an established way of thinking. The missional church conversation challenges some of the most basic assumptions we have about the nature and purpose of the church. Implicit in this conversation is the need to challenge and change some of our assumptions concerning the practice of church life in North America. Are small groups the answer or just another timesink? In the sermon yesterday Bob stated quite emphatically that living a life in contrast to our surrounding culture was critical if we are going to advance the gospel in our community. When I hear and read that type of statement two thoughts come to mind: 1) That is absolutely true, and 2) I don’t know how to do that and if I did I’m not sure I much want to. The good new is we now have the answer – small groups! All we have to do is have a focus on small groups and living out “the way” part of John 14:6 will happen – we will live a life in contrast to our culture. If it were only that simple. As I dialog with pastors and church leaders across North America, I hear many stories that resemble that of my own. They read a book, attend a conference, or start a 40-day small-group campaign. The conclusion usually is, we need small groups to generate community. The leaders imagine that a small-group structure will address the challenges that churches face in the midst of the fast-food culture. I have been helping churches develop small group systems since the early 1990s. Throughout these years, I have observed churches that have experimented with many different small-group models. Some have failed while others have entered into the land of great success. Most have wandered in the land of mediocrity, searching for ways to develop their groups. The difference between success and failure doesn’t correlate with a particular model or specific structure. In fact, one church could copy the exact structure and procedures that another church used successfully with drastically different results. If the structure was not the key to success, what was? If small groups alone did not help a church enter into a radical lifestyle for God’s kingdom, what did?